Boys… They have it tough. The gender attainment gaps in Primary school result in a reduction of life choices and chances by the end of High School. In 2011 48% girls went to University whereas only 37% boys had the same chance. At our INSET with Gary Wilson (www.garywilsonraisingboysachievement.co.uk) on Friday we were taken through the challenges of boyhood and the barriers to boys learning. From succumbing to the peer police (“Better to be seen not to be bothered by winning than to try and fail.”) to issues with independence; with parents who have been lured into the false impression that it’s easier to do everything for our boys rather than live with constant nagging, raised blood pressure and ranting that even the smallest of requests can result in. From low self esteem to the negative labels society puts onto boys from a very early age Gary is on a one man mission to change these negative stereotypes (once challenging British Home Stores when they advertised a boys T-shirt in their Spring Collection declaring “Lazy and proud of it!”). – Promote breakfast – by not eating breakfast by 10.30am we have the reaction speed of a 70year old. – Promote a “can do” ethos – internal auditory is louder in boys heads. – Positive visualisation ensures success – Imagining yourself doing well means you most probably will. – Feed your brain! Giving children fruit and a drink prior to test helps with attainment. – Assist neuropathways by ‘piggyback’ learning- teach someone else what you’ve learned. – Promote creativity- children who play instruments do better at school. – Develop leadership capacity in boys so they get attention for the right reasons. – Boys prefer active learning. Although there’s a need to balance approaches across learning styles make sure there’s enough active learning events in our lessons to motivate and engage so boys work to the best of their ability. – Superheroes! Tapping into this genre helps to boys to make links to the real world. Staff should value play based on children’s interest whilst promoting order and boundaries. Superhero play = emotional intelligence = clear rules = structure = guidelines for success. – Ban setting! Setting reinforces negative stereotypes. The younger a child is ‘set’ the worst they’ll do at age 16. – Celebrate success by using hand written ‘I did great work’ style labels as success stickers to give parents a focus to celebrate success at home. – Aifl- use those lolly sticks or a random name generator (http://www.classtools.net/education-games-php/fruit_machine) to ensure children are focused and expect to be included in the lesson. – Plan the plenary! Don’t let the boys skip any part of Kolb’s learning cycle (http://www.simplypsychology.org/learning-kolb.html) in their rush to be finished. – gives children strategies to deal with dilemmas. -Set up Systems – When in doubt give them a system! – Think in the short term for long term success: Short term goals, short term targets, short term rewards = boys striving for success. -Make learning real and fun by giving children real audiences. Use Crazy Talk (http://www.reallusion.com/crazytalk/crazytalk_trial.asp) software to manipulate pictures and provide a purpose to writing. – focus on fine motor control development. Often this is an area of difficulty for boys (http://scotens.org/sen/articles/primary_reflexes.pdf) so praise for quality ideas when quality presentation is a mountain too high! – Consider training staff to teach the children peer massage (http://www.misascotland.org.uk/index.htm) or yoga (http://www.yogascotland.org.uk/findteacher.html). Positive touch and relaxation helps to keep students calm, focused and motivated. – Choose the right time of day to teach important stuff- not when we’re excited. – don’t criticise if you can’t read my handwriting, it’s not always the most important thing. – writing in small chunks is best. – we want to write in any way we want! – use mind mapping ideas. – you start the story, let us kids finish it. – give us basic ideas to get started. – use lots of props. – use mind maps as a form of plenary/ help me share my learning with a partner. – read to us – it helps us with our own stories and poems. – let us act stories out. – give us time to think and talk. – model writing – use visualisers to share pupil work. 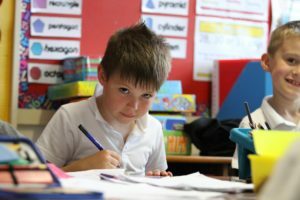 All the approaches above are very much good learning and teaching and would benefit any pupil regardless of gender but with a focus on engaging boys and bridging the attainment gaps the whole class will benefit. This entry was posted in Creativity, Curriculum, Ideas, Involving Pupils, Professional Learning and tagged activelearning, Attainment, Boys, engage, involve, learners, pupils on November 18, 2012 by Caroline Gardiner.